TYRONE MCKENNA is refusing to ask Carl Frampton for secrets on big ﬁght rival Jack Catterall. He challenges for Catterall’s WBO Intercontinental Super-Lightweight crown at Belfast’s SSE Arena on Saturday in a ﬁght where Frampton must be dreading which side to support. The two-weight world champion is a close friend of McKenna and trains alongside Catterall at their trainer Jamie Moore’s gym on the outskirts of Manchester. Catterall has taken the BT Sport televised ﬁght at short notice and replaces injured Phil Sutcliffe. McKenna, 28, said: “Carl was actually supposed to walk me out to the ring for the ﬁght when Phil was the opponent, but that has changed. I wouldn’t want Carl in an awkward position. “I was going to ﬁght Tommy Coyle before and he was in camp with Carl. I always seem to be ﬁghting friends or friends of friends. Everyone in boxing seems to know each other. “I would never put Carl in the position where he talks about one of his gym mates. I wouldn’t like him to ﬁght one of my team mates and ask about them. 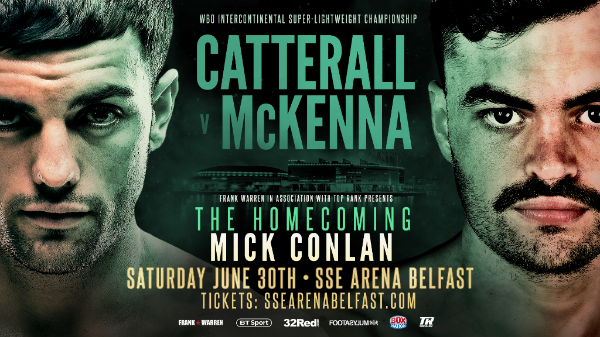 McKenna who is unbeaten in 17 ﬁghts has seen his proﬁle grow in the last 12 months and the 6ft 1in southpaw believes his popularity will mushroom after this weekend’s ﬁght that has captured the imagination. Tyrone who outpointed Anthony Upton in his last ﬁght added: “My last six ﬁghts have been on TV and I have a big fan base now. “I have never taken an easy ﬁght or turned down a ﬁght. I was offered Jack when Phil pulled out and straight away I said, ’Yes’”. The bill is topped by Michael Conlan’s Homecoming bout against Brazil’s former world title challenger Adeilson Dos Santos. There is an all Dublin rematch when Jono Carroll defends his IBF intercontinental super featherweight crown against Declan Geraghty. Derry’s Tyrone McCullagh meets Glasgow’s Joe Ham in a vacant Celtic super-bantamweight title clash that doubles as a British championship eliminator. Tickets prices £250 (Inner Ring Hospitality), £200 (Outer Ring Hospitality), £120, £100, £80, £60, £50, £40 are available from the SSE Arena website.